Ever since my sister was in the Camp Fire Girls in first grade and had to sell Almond Roca for their fundraiser I’ve been in love with toffee. I find that buttery crunch to be positively addictive – my hand just keeps grabbing for another “little piece”. At least with Almond Roca there’s that gold foil that you have to contend with which helps to pace your consumption. But when you make your own toffee at home…and there’s a whole entire pan of it sitting in front of you…unwrapped…and it’s your job to break up the pieces…apparently it takes a stronger person than myself to resist. 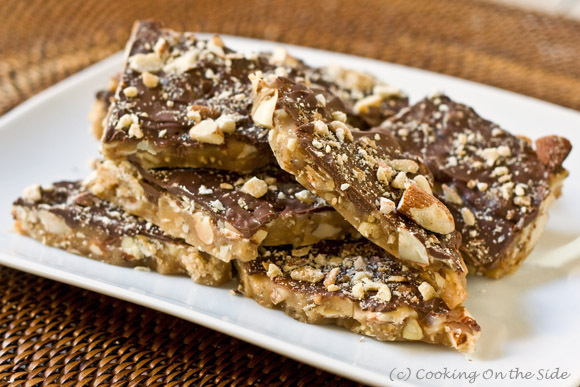 Making toffee is incredibly easy. You just heat a few basic ingredients – butter and sugar, for the most part – to a hard boil, spread it out on a pan, wait for it to cool and harden and break it up into rich, decadent little pieces. It keeps really well in an air-tight container at room temperature for up to two weeks, but I think I’ll need to divvy it up a lot sooner than that if there’s to be any left for holiday gifts! Spread walnuts and almonds in a single layer on a jelly roll pan. Toast nuts in the oven for 5-8 minutes. Transfer to a food processor and pulse until nuts are coarsely chopped (alternatively, you could chop them by hand on a cutting board). Set aside 3/4 cup of the chopped nuts for topping. Once cool, clean the jelly roll pan and grease it with butter. In a large heavy saucepan, combine sugar, salt, water and butter. Bring to a boil over medium-high heat. Cook, stirring occasionally until candy thermometer reaches 290°F. Remove from heat and stir in combined nuts. Quickly spread into prepared pan. Sprinkle chocolate over hot toffee. Let sit 4 minutes then spread evenly. Sprinkle with reserved nuts, pressing lightly into chocolate. When cool break into pieces. This would be a dangerous thing for me to keep in the house. Absolutely dangerous in the most delicious way! .-= Kristen´s last blog ..Celebrating 3 Years (Recipe: Monkey Bread) =-. I love toffeee too! Yours is beautiful, love everything about it! May I know the sheet pan size you used for this. Thanks. I used a 17″ x 12″ jelly roll pan. I love toffee too! I’ve been thinking about making some, but lost the recipe my grandmother gave me. I’ll have to give this a try! .-= Mindy´s last blog ..An Update… =-. 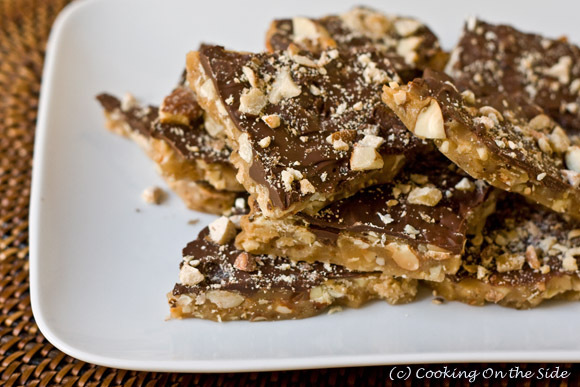 That toffee looks so good! Ummm…. I can’t stop eating these little bits of heaven!